This summer we took a short break in Paris. When we booked the trip I decided to drive as flying would be too much of a pain with the various rail transfers for such a short distance. I'd also never used the Eurotunnel before so fancied trying that out. What car to take, though? I could have taken my own car but this was a good opportunity to evaluate another car over a distance and with my son, Eddie, on board it would highlight how suitable it was for children. The Volvo XC60 is a decent SUV that has a lovely interior, a wafty ride, comfortable seats and now comes with Volvo's all-new D4 engine. A Volvo XC60 D4 R-Design Lux in Passion Red it was then. Day one saw an 8am start for an 11.50am check in time on the Eurotunnel. The M4, M25 and M20 were relatively traffic free and I used the adaptive cruise control for 90% of the journey. The car had a manual gearbox but adaptive cruise still works well with it. The seats are great in Volvos but the R-Design's leather, electrically adjustable seat (the passenger side is manually adjustable) was super comfortable. Eddie spent the morning in the back, watching a movie on the headrest mounted DVD player. The car didn't come with headphones so he plugged his iPhone earphones in. They were a bit too quiet but he was happy enough. The car has plenty of storage space. The boot is big and the glove box is pretty cavernous. There are cupholders ahead of the armrest and there's a cubby under the 'rest itself as well as the door pockets. I kept myself entertained with digital radio and a playlist I'd put together for the trip streamed via Bluetooth from my iPhone to the excellent sound system. We arrived at Folkestone ahead of schedule and were put on an earlier train. You check in whilst in the car and are waved through and on to the train itself where you park up and stay in the car. The XC60's electronics shut down after 10 minutes (to preserve the battery no doubt) but the journey under the English Channel is only 20 minutes long. In Calais and the Volvo's adaptability reveals itself. A twist of the indicator stalk and km/h is shown in the digital dash. A couple of sub-menus in the infotainment system and the headlights are set to driving on the right. And so to Paris. 180 miles and driving on the wrong side of the road. My brain needs rewiring but the car is so easy to drive it lets me recalibrate without undue interference. The D4 engine is strong. It's a 2-litre turbodiesel with 181bhp and 280lb ft of torque. In the D4 power is fed through the front wheels. This is fine for economy but highlights the torque and lack of locking differential. It does suffer from torque steer. An e-diff might have been a sensible option. This doesn't matter on the motorway though. The ride is super-soft, the controls well placed and the infoscreen and dials clear and easy to read and use. We arrive at our hotel having covered 310 miles. The fuel gauge is showing just over half full and the XC60 has returned over 44mpg. The car reckons there's another 430 miles in the tank. In the UK we cruised at 70mph but in France the limit is 130km/h so we travelled at 80mph. Day two was Disneyland, which was 10 miles from the hotel. Eight members of my family were at the hotel so Ed rode up front and my two nieces, eight and six, were in the back. The XC60's integrated child seats perfectly suited them, and there was space to sit someone else in between. Day three was Paris itself and we left the Volvo at the hotel and used the dreaded public transport. Day four of our short trip saw Eddie and me leave at 9am bound for Calais. The XC60 soaks up the miles. The engine is smooth and quiet and the various driver aids (most of which are options) are useful. Again we arrived early and were put on an earlier train. The M20 was pretty busy but the M25 was another level of hell. It was nose to tail all the way around to the M3 where we dived off to escape the misery. The car's stop/start function saved a few mpgs but economy suffered as we crawled along for mile after mile. Near Gatwick we had 60 miles left to go and the trip computer reckoned there were 65 miles in the tank. I was absolutely bricking it and drove as frugally as possible. Having a manual gearbox means you can eke out the fuel but we were still flying too close to the wind for my liking. When we got home the car had just 10 miles left in the tank. But we'd done it. 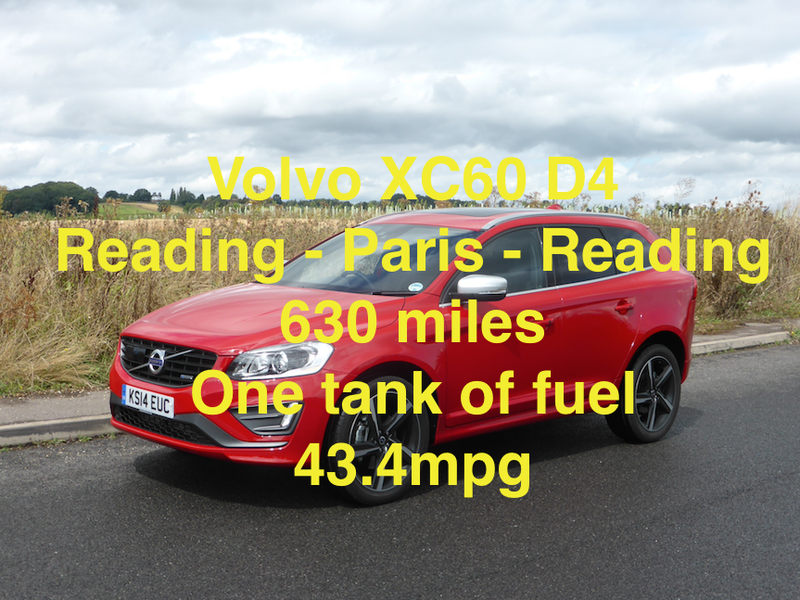 5 miles west of Reading, Berkshire to the suburbs of Paris and back on one tank of fuel. Impressive stuff. I was ambivalent towards the XC60 before we set off, preferring the V60, but after 630 miles and four days I'd grown to love it. Eddie liked it too - a lot. It is a very likeable car. You can see the XC60 D4 R-Design Lux's price and stats here.